My very first camera was something my father bought me when I went on a school trip to Switzerland when I was twelve. It was quite a long time ago so it was beautiful, but not terribly sophisticated or expensive. I had no idea how to use it. It was a classic black and white film camera, you gave it to the drugstore, and they processed and printed postcard-size pictures. My biggest regret in life would be not documenting everything I experienced, the way Jacques Henri Lartigue did from the age of five. I would have loved to have had an iPhone fifty years before anyone else did because I have so many memories of such extraordinary things, especially when I started working at René of Mayfair. I befriended the photographers, that’s what I remember. My favorite was Barry Lategan, a South African who came to London and eventually became one of the top Vogue photographers, specializing in beauty and hair, and he was good at fashion too. He took those iconic images of Twiggy that helped launch her career. He and Leonard of Mayfair worked together frequently, and I just loved his photography. I got to work with him once when I was quite young, maybe 20, and I was hopelessly terrified to actually be in a studio with Barry Lategan. I was working for Elizabeth Arden, and they gave me a piece of paper and told me to go to this studio in Chelsea to do hair for a photoshoot. So I got there and it’s filled with people: a famous makeup artist, Barry (who I don’t think even said hello), three statuesque models, and then there’s me, with my little bag of tricks. At lunchtime the photo assistants would set up a ten-foot long piece of wood over a trellis table, and all this food came out. I had never seen food like this before. It made a deep impression on me. My ambition was to work with Barry in his studio more often, but it didn’t happen. I left England in 1972 to move to South Africa. I started doing hair for one of the best fashion photographers in South Africa, Georgina Karvellis. She would send a girl in, often her girlfriend Marge, with a tear sheet from American Vogue. I would do the hair, and they’d jump in a car and go to the studio without me – and yet, amazingly enough, the hair looked pretty fantastic in the photos. I had a friend, Alan, who was a yoga teacher and a photographer, and he had a studio in his house where we used to do pictures for Bumble. I moved to New York in 1977, and then Barry moved to New York around 1978 – he fell in love with someone, that happened a lot. I used to work quite a bit for Mademoiselle magazine, where the beauty editor was very supportive of Bumble and I was comfortable with her. I overheard her talking about doing a beauty story with Barry Lategan, so I asked to do the hair. The studio was in the West Village, I still walk by it sometimes. He didn’t remember I was the same little guy from London. I started talking to Barry about living in South Africa, and it turned out he knew my first wife Di, because she’d been a model there. We all had dinner together a few times. He asked if I’d like to come to Rome and shoot the collections with him for Italian Vogue. I said yes, I’d like that very much. In those days Rome was the fashion capital of Italy, and had fashion shows twice a year. There were two studios, with Barry and I in one, and David Bailey with the legendary Italian hairdresser Aldo Coppola in the other. They actually asked me if I’d cut Aldo Coppola’s hair, that was kind of a thrill. We’d start getting the models ready and photographing them at 6pm, and it would go on until about 4 o’clock in the morning. It was a great experience. I did a few more shoots with Barry. There was one stunning story that we shot in Fort Lauderdale, with ten pages of saturated blue skies and colors. (This was where I first heard the name Steve Hiett, because people kept asking if it was inspired by his work.) I also did a few ad campaigns with him. But I realized that if I was going to make Bumble a success, I couldn’t be out of the salon so often. I stopped dreaming about being an editorial hairdresser at that point. Barry Lategan for Vogue Italia. Hair by Michael Gordon. Styling by Nicoletta Santoro. I started taking photos for myself around the early ‘80s, when my daughter Sian was maybe three or four. I used to take her and her big sister Heather away once or twice a year on vacation, just the three of us. I took pictures of the girls at the beach, and they came out well. I’d always been around photographers, and one day I just knew how to take a picture. Eventually I moved from photographing kids to photographing models. In 1985, we had moved Bumble to the new location on 56th Street. On the top floor of the building was a model agency called Zoli, one of the top agencies at the time. They often sent their new girls downstairs to Bumble to ask us to make their hair different, to give them a look. That’s where I met Stacy Williams, from Mechanicsburg, Pennsylvania. It’s common that if you’re a model with a photographer boyfriend, they usually take the best photos of you, because there’s trust and intimacy between you. Stacy’s friends started asking for pictures, so we had a steady stream of girls that wanted to test at Bumble. I got so much information about photography just from watching talented people on set. I was never formally trained as a photographer. There were only four things you could control on a camera, which did a lot: the f-stop, the speed of the film, the aperture opening, and the shutter speed. Eventually it just clicked for me. Photography must have been just occupying my brain until suddenly I figured out how to do it. I was also building a library of images from English Vogue, American Vogue, Italian Vogue, Avedon and Penn and everyone I’d worked with – my eye was becoming more sophisticated. 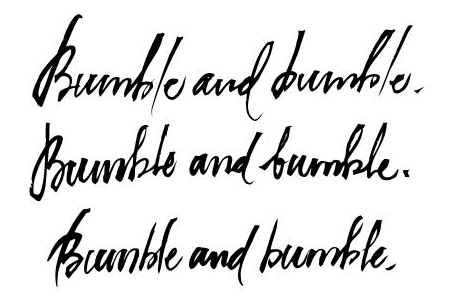 While digging through old photos in our archive for a presentation I was giving, I stumbled upon some scans of Bumble and bumble’s logos throughout the years. Even though I’m no longer involved with Bb., I enjoyed reminiscing about the journey from our salon in South Africa to the brand we built in New York. I thought it might be interesting to travel down memory lane with you and tell the story of each logo. I hope you’ll find it interesting, as well. When we first opened in Johannesburg, I cut the hair of the creative director at Grey Advertising, the most renowned advertising agency in South Africa. One day, as I was cutting his hair, he offered to do our logo. Nowadays that might cost $50,000, so it might seem strange that he did in exchange for the occasional haircut, but people used to do things like that. I loved the curvaceousness of this logo; so 70’s. The window of the salon was painted over with a very rich blue with the logo in silver, because we didn’t want people looking in the window. This was for a few reasons. The first was because we had, in my opinion, the most unique and beautifully designed salon maybe ever, and I preferred people come in the front door and see it for themselves as opposed to just peeking in from outside. A few of my clients at the time were the best interior decorators in Johannesburg, and they also redesigned the entire salon in exchange for haircuts. It was beautiful, structured as an octagonal maze, and it was by far the best salon design I had ever seen. The second reason was we usually stayed open much later than was officially allowed, and needed privacy to continue doing that. So, we just had this big, curvy logo on the window. It was lighthearted, flippant, and funny, and reflected the playfulness of the name and the atmosphere of our salon. When I relocated to New York, I didn’t have enough money to redo our logo. I quickly became so nervous about our name, our look. I thought, “What the hell am I doing coming to New York with a name like Bumble and Bumble?” I worried I’d become a laughing stock, and that I would fail even worse than I had imagined. It really was such a stupid name in comparison to the rest of Hairdresser’s Row, which was very, very French. Luckily, I met a fabulous graphic designer called Mike Quon. And what do you know? He did our new logo for free. It was very cool and everyone absolutely loved it; it actually won a few awards. For me, I always knew it was great, but had a feeling that it was too rigid for us, at least compared to our first logo. Regardless, people loved it, and we kept it for about five years. Looking back, I suppose we were the only salon that could afford to have a bit of fun with our logo, because everyone else was so buttoned up. We could afford to morph and play around and change, and I think this logo reflects that. After about eight years of real success, we decided we needed to move. Our lease was up and we had to find a new place to go. We found a fantastic building in the design district that used to be a carriage house, about 12,000 sq. ft. It was the mid 80’s and everything had an air of Miami Vice. This era unfortunately influenced the salon design, which was pretty hideous. I don’t think I had grown into good taste at that point. I made Mike Quon change the logo again, against his wishes. I regret it to this day. Whenever I think about how the salon looked and how I looked, I groan. Looking back, I was this logo’s worst critic, but I still think it was pretty bad, even now. But we really had to recreate this entire new space from scratch, and this was the result. It was certainly a sign of the times. I only wish I would’ve met Ross Anderson sooner, who ended up making the space incredibly beautiful. So we had this massive space, and it quickly filled up with new business. This is when I first met Tibor Kalman and Alexander Brebner, who were working for the famous design firm, M&Co. Tibor was a charismatic, verbally gifted guy, that had this very cool agency with great clients. He was the best salesman I ever met. Alexander was working for him when he got his first haircut with Howard [McClaren] at Bumble and bumble. I wanted to change the logo again, and Alexander had actually already started designing t-shirts for us, so we figured who better for the job than M&Co? Their team wanted to do a complete salon redesign along with a new logo, and of course I was on board. For the interior, I was introduced to Ross Anderson, who did really cool work with industrial aesthetics and materials, which was unusual at the time. He undid everything that was bad and brought out all the good underneath. He found gorgeous steel behind all of the enameled stations, he changed all the ceiling tiles. Meeting Alexander and working with him during this time at Bumble I believe we were at the height of our creativity. I think the work he did for Bumble in that period is legendary.